PGT Windows have been the popular choice for window and door replacements in the Tampa and Sarasota area for decades. During this time, Hurricane Windows & Doors has positioned itself as one of the leading PGT window and door installation companies on the Gulf Coast by providing these high quality PGT products at prices that are unmatched by our competitors, installation by Exclusively Trained and Certified Installers, Lifetime Warranties on ALL PGT products we install, and the understanding that our customers ALWAYS come first. At Hurricane Windows & Doors, we install more PGT windows and doors in homes, condominiums, and mobile/manufactured homes across the Tampa Bay and Sarasota than any other window on the market. We choose to offer PGT because it is the only window of its kind. Made in Florida from start to finish (NOT just assembled here like the others may hide from you), including an on-site PPG glass plant, PGT is capable of producing a finished product that has proven to stand the test of time and hold up against the harsh weather we face year round in Florida. PGT offers multiple window and door options including the ALL NEW 2015 Vinyl Winguard Series and 2015 Vinyl EnergyVue Series. *ALL NEW* PGT 5500 Series Vinyl Winguard Windows meet Miami-Dade County High Velocity Hurricane Zone (HVHZ) Building Codes. This also means they will be up to building code anywhere in the United States. As the original residential impact window, the Winguard has never had a single recorded failure during a natural disaster. The newly designed Winguard Series has improved even more, featuring PGT’s exclusive new “Snap-Lock” automatic locks, Tilt-Latch Secure Connect Technology, Aluminum Interlock built-in to the sashes, PGT Comfort Lift Handles, wood grain color options as well as new interior and exterior colors, and more! View our 2015 PGT Winguard page. View 2015 PGT Winguard brochure PDF. The PGT 2200 Series Vinyl Window is a replacement non-impact rated window and a perfect solution for price, features, and overall quality. This is a very popular window with our customers. We use this window quite often in mobile and manufactured homes due to the design of the frame. *ALL NEW* PGT EnergyVue Windows are the non-impact rated version of the Winguard Series. 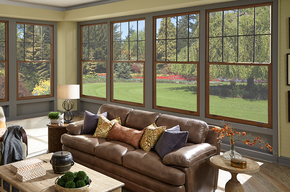 Using an impact rated frame and PGT’s superior insulated glass technology, the New EnergyVue Series windows are designed to handle wind speeds well above 140mph in most sizes, ensuring your home will be safe during high windstorms. The EnergyVue also features all of the newly designed offerings that are available in the new Winguard, including “Snap-Locks,” “Comfort Lift Handles,” “Secure Connect,” Aluminum Interlock, and more! This window is commonly used in replacement window applications where hurricane shutters have already been installed or will be installed by us. View our 2015 PGT EnergyVue page. View 2015 PGT EnergyVue brochure PDF. PGT 570 Series and 470 Series Sliding Glass Doors: The PGT Winguard 570 Series features a High-Impact Hurricane Rating by incorporating laminated storm resistant glass. The EnergyVue 470 Series is the Non-Impact Rated version of the door. Both feature insulated double pane glass, low-e, and argon gas for maximum energy efficiency that meets the most stringent Energy Star demands. Visit our PGT sliding glass doors page. View PGT sliding glass doors brochure PDF.